This page includes some affiliate links. Finding homeschool curriculum can be a daunting task for parents considering teaching preschool at home. Just a Google search for those terms can bring up thousands of results! How is a parent supposed to know which one will really be best for your child and your situation? The true answer (and one that not many will really tell you) is that there is no ONE right homeschool curriculum. Of course, each company that sells a curriculum program will try to convince you that their is the best, because they want you to buy from them! Most homeschool curriculum programs have good qualities, and of course, some are better than others. But in the end, it's up to you to review them all fully and decide which one will meet your needs the best. The perfect fit for one family may not work for you. That being said, I have looked through some of the most popular homeschool curriculum programs on the market to give you an educator's opinion on each. Hopefully my reviews below will help you as you navigate your homeschooling options. If you are a homeschooling parent, but are specifically looking for a Christian preschool curriculum, please check out my reviews of the best programs available in that particular market. As an educator, I have had experience looking through and evaluating many homeschool curriculum programs on the market today. There are some that are terrific and some not so much. Based on current child development research – You might be surprised at the number of programs that are put out there by well-intentioned, but uneducated people. *Practical to implement – How can you teach with a program that you can’t even understand yourself? Provide support and training – You need to know that there will be help available should you need it. Appealing to children – We are teaching children after all, so of course the curriculum program must include elements of fun! Many times you already know which preschool themes or topics you want to teach. You just need some ideas for lesson plans for art or science or some gross motor games for that theme. There are two sites that I think will help you! Preschool Plan It is my sister website. 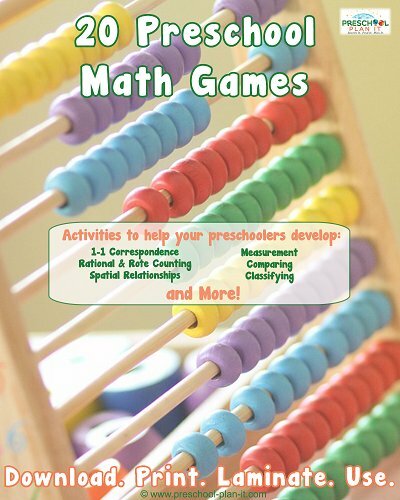 It is filled with over 145 themes at last count and over 4,000 preschool lesson plans! You'll find ideas under each theme for all 12 interest learning centers from Art, Blocks, Circle Time and Dramatic Play to Gross Motor Games, Science and more! ﻿A YEAR! Quite the amazing price for what is offered! CLICK HERE to hop over there and check out what she has to offer! Hooked on Phonics (HOP) is one of the most popular reading program for children in preschool through grades 3 and up. The program uses a multi-sensory approach to teach reading through phonics, phonetic readers, audio CDs, CD-ROMS, flashcards, and workbooks. I have an entire page dedicated to the review of this program. Click here to read it! Hands on Homeschooling offers lesson plans and activities for preschoolers age 2 through 5 (kindergarten) that can bring purpose to your daily play. Some people will choose to offer the activities as a way to keep a child busy during the day, some are looking for a way to prepare a child to enter a “regular” school system, and others may see this as the beginning of a lifelong educational experience. No matter where you are along this journey, Hands on Homeschooling has a lot to offer. Oak Meadow is a very popular homeschooling curriculum. I found this curriculum program to be engaging, easy to use, and not hurried at all. Many programs make the parent feel as if they need to cram in all the activities each day/week and it gives the whole experience a rushed feeling. Mother Goose Time is a professionally developed preschool curriculum that nurtures the whole child and supports the child's social, emotional and intellectual growth. Each tool included in our monthly curriculum kit is intentionally designed to meet a range of preschool skills. All tools are based on research and best practices. EDIT: This curriculum does not seem to be available as of late 2014. Their website is under construction. If you find it available, please contact me to let me know so I can update this section! Thank you! Adventures In Learning is a professionally developed, age-appropriate, complete monthly preschool curriculum for ages 2 1/2-5 that is perfect for child care homes and centers of any size. Their goal is to enhance the development of readiness skills, encourage a love for learning, and promote family involvement. As child care providers, parents entrust us with the care and nurturing of a most cherished part of themselves-their children. Therefore, providers should be dedicated to delivering a high-quality learning environment to children of all ages. Preschool children are capable of more than mere playtime and naptime--they can begin to develop important early learning skills if provided with the right learning environment. However, child care professionals are challenged daily to find appropriate teaching materials at an affordable price with limited time to plan activities, all while trying to teach a wide age range. Adventures In Learning tackles these challenges.